I was headed for Nuuk, Greenland, to attend the Inuit Circumpolar Council (ICC). As the doors closed on my IcelandAir flight from JFK, my iPhone told me the International Whaling Commission (IWC), with U.S. assent, had voted to allow Greenland to kill 27 humpback whales for aboriginal subsistence. An hour out of Keflavik, I realized the humpbacks that have now become targets of the hunt were swimming a mere vertical mile below me. I had come to know this stock of whales in the Caribbean at Samana Bay and out on the Silver Banks. They were extraordinarily friendly toward me as I filmed them underwater. We looked at each other eye-to-eye, each knowing the other was aware of the other. The idea of their being harpooned is appalling to me. The quota granted by the IWC specified the hunt could not begin until mid-October. But Greenland has announced the hunt will begin immediately, in flagrant violation of the permit. After landing in Nuuk, the capital of Greenland, I would find other violations. Along most of their migratory route off the eastern seaboard of the United States, the humpbacks are protected. In response to protection, they've become increasingly friendly and curious toward the whale watchers who now are part of a multimillion dollar business for charter boat owners, hotels, restaurants and transport companies. They approach boats and eyeball passengers with astonishing trust. That trust will now be rewarded by a harpoon. Aboriginal hunts of marine mammals are a highly complex ethical issue. It is true that the Inuit and their cousins have traditionally thrived on what they call natural food -- caribou, seal, beluga, whales, and other marine mammals. They do not have much money with which to draw food from the cash economy, and they do not fare well on the kind of food eaten by Europeans and Americans. But it turns out that Greenland's hunt for whales is as much about profits as it is about aboriginal rights. I discovered in Nuuk that Greenlanders are not observing the terms of the IWC quota that permits the hunt be conducted solely for aboriginal subsistence purposes. 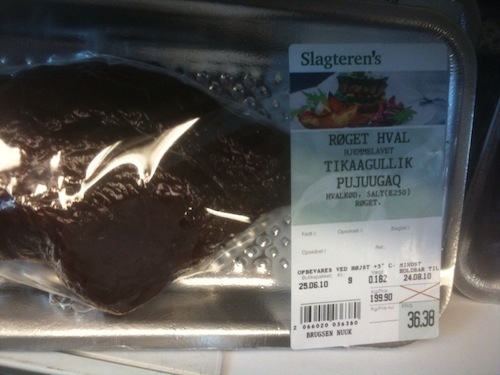 I checked out markets and restaurants and immediately and easily found whale meat for sale in commercial channels. To document my finds, I used my iPhone to snap stills and record video. In the supermarket I found packaged whale meat. In a Thai restaurant I found whale sushi and whale and Rangoon Whiskey soup. In a greasy spoon burger/pizza joint I found whale steak. The Inuit of Greenland complain that they do not have enough whale to sustain themselves. They may be having a hard time getting whale meat because the big money guys are sucking it all up for the more lucrative commercial trade. My final discovery came on the last day of the ICC. A young Inuit from eastern Greenland told me pleadingly that his village needed to take whales outside the IWC quota. "We steal them," he told me. "What species of whale are you taking?" I asked. "Any kind that the elders tell us," came his reply. Humpbacks have been missing from Greenlandic waters for sixty years -- hunted out by whalers. Their population has now recovered to the extent that explorer whales have made their way back to ancient feeding grounds. This should be cause for joyous celebration -- not a dreadful slaughter.